Editor’s note: Melissa Cortina is a butcher based in Los Angeles. She lived and worked on a sustainable farm in Sonoma, attended Le Cordon Bleu in Paris, and learned butchery at the hands of master Italian butchers before settling once again in Los Angeles, her home. Melissa managed Lindy & Grundy’s Local, Pastured, and Organic Meats for two years. 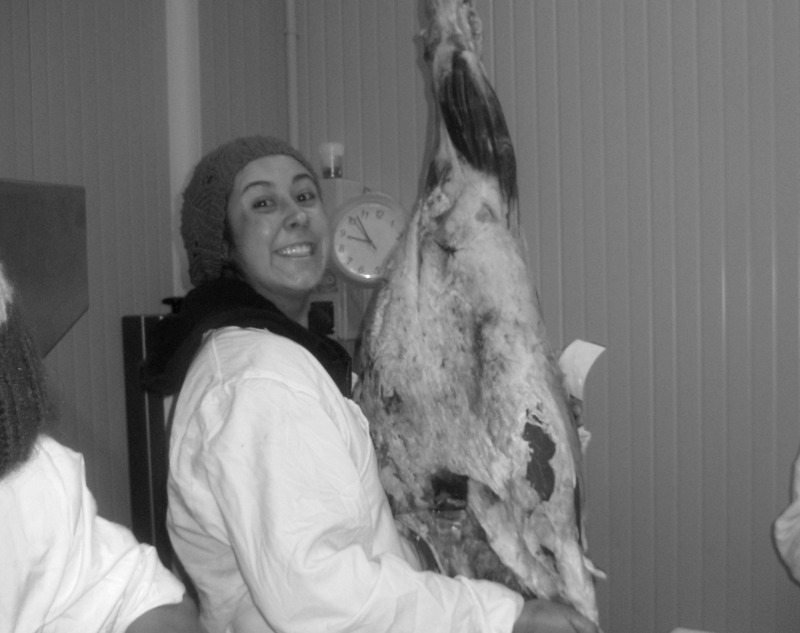 Currently, she works as the HACCP Coordinator for Cook Family Butcher Shop in San Diego. Hello, and welcome to The Butcher’s Table! Here you will find recipes and videos designed to demystify meat, stories from my life as a butcher, and conversations with small-scale California ranchers. The Butcher’s Table will give you the knowledge to select high quality meat and the confidence to make classic meat dishes at home. The journey from working the line to the working the butcher counter has shown me that the chef’s table is entirely different from the butcher’s table. I first experienced this disparity while working for famed master butcher, Dario Cecchini. At his popular steak restaurant in the heart of Tuscany, simplicity reigns supreme: Dario serves nothing more than beef tartare, steak cooked rare, and simple vegetables. There are no ten course tasting menus, no dishes containing more than five or six ingredients. Still, crowds of people travel from around the world just to take their place at his table. While the utmost care is paid to preparing this simple food, Dario pays equal attention to the atmosphere of the dinner itself. Every night at his crowded, boisterous restaurant, total strangers sit elbow to elbow at long tables, eating and talking like the best of friends. Witnessing those dinners night after night, I began to understand that the spirit of The Butcher’s Table is about more than using the whole animal. It’s about celebrating the abundance the animal provides us, and sharing that abundance with the community. In recent years, the small-scale American meat market has experienced tremendous growth. Books like The Omnivore’s Dilemma and films like Food Inc. opened a Pandora’s box of information about the way food arrives at our tables, and how it affects our lives. More and more people understand that the industrial meat complex delivers cheap, accessible meat at a tremendous cost to animal welfare, public health, and the environment. As consumers, we want to understand the best way to respect the animal, the environment, and our budgets, but we are increasingly distanced from the knowledge our ancestors had about how meat is best raised, harvested, and cooked. Here, I’ll attempt to remedy that generational gap and empower you to enjoy the abundance of The Butcher’s Table at home.